Do you use the dictionery more then you think you should? Are the business memos you write filled with embarassing spelling mistakes? Have you recieved alot of low grades on your papers because of poor spelling? Did you notice that some of the words in the above questions (dictionary, fhan, embarrassing, received, a lot) were misspelled? If not, you need this book. This easy-to-use workbook not only teaches you how to avoid misspellings like the ones above, but sharpens your skills so you can recognize spelling errors right away. You'll write clean English, improve your grades (if you're a student) and increase your chances for finding a new or better job. (After all, resumes and cover letters with misspelled words often are discarded.) You'll also find: Diagnostic exercises that allow you to identify your weak spelling areas. Thorough coverage of key areas of phonics. The most commonly misspelled words and tricks for spelling them right. Ample opportunity for proofreading practice. Easy-to-understand explanations and plenty of exercises to test and refine your skills. An answer key at the back of the book to encourage you to work at your own pace and check your answers as you go. Even if you can't spare 30 minutes a day to learn how to break your addiction to your computer's spell checker, Better Spelling In 30 Minutes a Day allows you to custom-design your learning to take as little as five minutes a day. 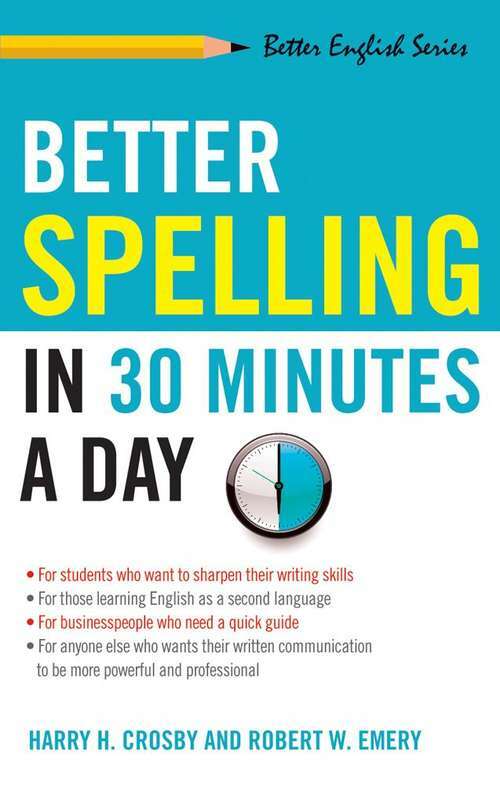 Like its companion guides in the Better English Series-Better Grammar In 30 Minutes a Day and Better Sentence Writing In 30 Minutes a Day-this book is just what the teacher ordered!